Thunderstorms, hurricanes, snowstorms and even technical problems can all lead to power failures. We try and avoid power outages, but some outages are unavoidable. During an outage DEC crews work to restore power to the largest number of people first. After transmission and distribution lines are fixed, the Co-op’s crews then fix problems in smaller neighborhoods or problems at individual homes. When there are issues with transmission lines, the co-op’s outage management system also allows engineers to redirect electric or “back-feed” from other substations to get the lights back on faster. Below is current reliability information from Delaware Electric Cooperative. We continue to make significant investments in our system to ensure the most reliable service possible. SAIDI: The average outage duration for each customer based on the whole system. 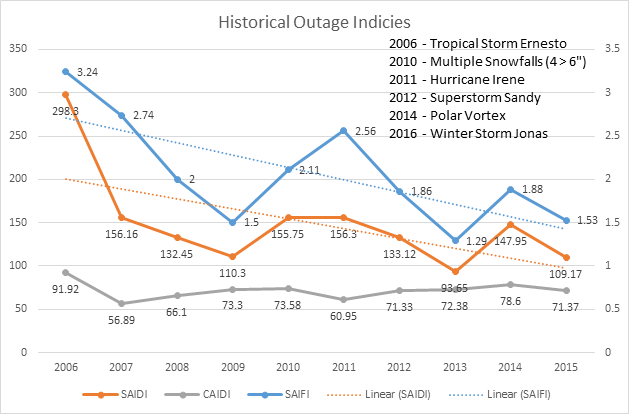 CAIDI: The average outage duration that any given member would experience per outage. SAIFI: The average number of interruptions that a member would experience based on the whole system.